Often used in the field of animal nutrition, stand-up pouches (Doypacks) are now as popular as ever. Due to its practical and consumer-friendly features, they will now increasingly be applicable in the food industry. 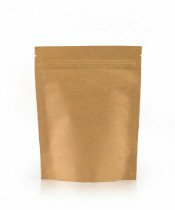 To store and preserve the freshness of the product, the pouch is equipped with a zip closure for reclosability. The product obtains a long keepability and 100% aroma protection, if the pouch is sealed above the zipper after filling. A convenient tear notch eases the opening of the pouch. In addition, the bag can be equipped with an aroma protection valve. With their ability to stand securely on shelves, stand up pouches have long been used as an excellent replacement for traditional bag-in-box or glass packaging. Whether transparent, made of aluminum or of an attractive (Kraft)paper/foil composite, the stand-up pouches can be manufactured in various tailor-made versions and formats.